2) This is a poem in several voices. through the last songs of the blackbirds. In reality, everything happens, then everything else happens. We think one thing is superior to another. Is one Mozart note superior to another? 7) All the poems in The Vixen (a female fox) arose out of the first poem. 11) The last poem is addressed to Vixen herself. 18) The media manufactured the name 9-11 to trivialize this day of agony. Are you one or several? Postscript: After Merwin's reading, many Stanford students went forward to get their Merwin books autographed. I had Merwin sign the newspaper ad and a flyer of his Poetry Reading. I told him about attending his San Jose Poetry Workshop and Reading back in 1987, when I was learing the craft of modern poetry. Somehow we got on the topic of Allen Ginsberg and Merwin asked me whether I know Ginsberg's Tibetan Guru, Chogyam Trungpa Rinpoche. 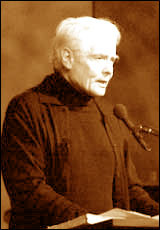 Since I knew of Merwin's negative experience with Trungpa at Naropa Institute, I told him about my experience with Trungpa: "He came to Brandeis University for a talk around 1972, and my friend Prof. Larry Rosenberg told me that I could get a "One-on-One Interview" with Trungpa in his office after his lecture. However my polypeptide research experiments in the Biochemistry Department went on longer than usual, so I missed the interview. Trungpa told me that I could get a ride with him and three of his disciples from Waltham to Boston where he was staying. I accepted the offer. Trungpa was in the passenger seat up front. I was in the backseat with a young couple. As the car sped along the Massachusetts Turnpike, Trungpa asked "Where is the beer?" The driver pulled out a 6-pack of Budweiser and passed it around. I declined saying that I don't drink alcohol and was concerned that the Highway Patrol may pull the car over for drinking while driving. But Trungpa was not in the least worried, asking me about my background in China. Meanwhile the young couple to my right were drinking, laughing, and doing some heavy petting and smooching. This was my first meeting with Trungpa and his disciples. I was reminded of Christ's "You shall know true Teachers by their fruits (students)." Afterwards, I declined all invitations by Trungpa's disciples to attend their events and lectures, even though their center was just a block away from where I lived." Merwin seemed delighted hearing this story, saying "That shows Trungpa was not a real master." I had a chance to shake hands with Bill Lane as his wife Jean went up to get Merwin autograph his book. Bill & Jean Lane sponsor the Writer's Reading & Colloquium program which brought many renowned poets and writers to Stanford, so I had a chance to thank them personally for this priceless gift.